I remember there were always mah-jong games being played at our tiny flat. I was too young to know who the other three people at the table besides my mum were but I remember afternoons when I would stand beside the table next to my mum and waited… for someone to pay my mum some money so I can run off with a coin or two. 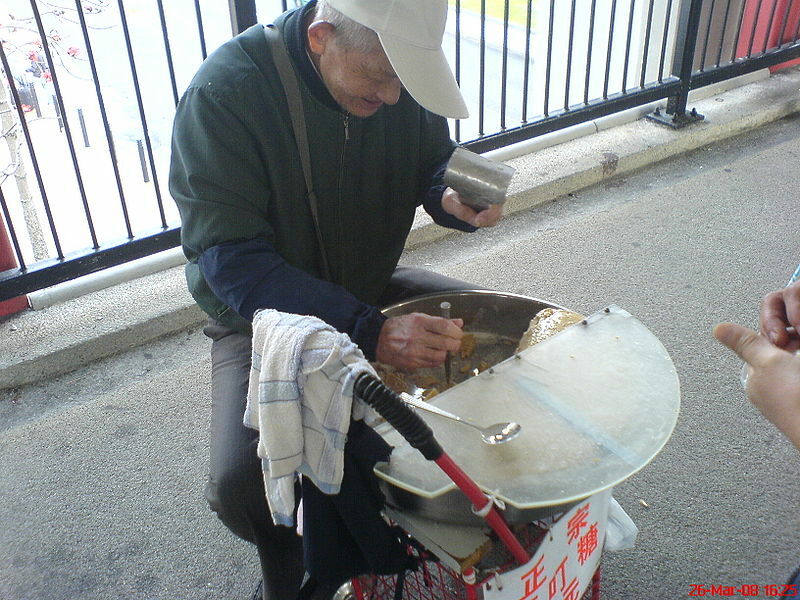 You see, there used to be a candy seller who would carry a tray of hard maltose candy (ding ding tang 叮叮糖) and wooden support for the tray. He would stop at some spot outside the building and put the round tin tray on the wooden support (the legs of the tray). Then out came the flat chisel and mallet. Ding, ding, ding, away he chipped at the hard candy covered in flour. The sound of the chisel hitting the mallet (what? Did I really type that? Shouldn’t it be mallet hitting the chisel? DUH!) acted like the bell of an ice-cream seller, telling people that he was there with his ware. With the ten-cent coin I grabbed from the mah-jong table, I would dash out of the flat, stand in front of the man and his tray and wait while he chipped at the hard-as-rock candy. For the 10 cents I grabbed from the mah-jong table, I got a few small pieces of the candy coated in white flour and wrapped in a piece of paper. Ah, that sounds like such fun. Thanks, RM. I forgot to add that the candy-man no longer prowls the street these days. No more hard maltose candy coated in plain flour 😦 Even though some tried to replicate it, the candy still doesn’t taste like it did in the early days. Loving reading about your childhood and your culture, Judy-girl!! As you know from our chats, your culture is very fascinating to me. I was stunned, also, that gum is banned there. What a shame! The idea of the ‘Candy-Man’ is so cute. I can just picture you as a tiny girl holding out your coin as he chips away at the candy. Can just see your little face as you waited for the candyman to finish..It reminded me of the rock candy we used to get, but from the store..
Just love these little tidbits from your memory..Please keep them coming..
I’m glad I’m only at the novice stage of mah-jong because the way I play there’d never be candy money for me.. I hope you’ll keep sharing. LOL Sue! Maybe next time you come here you can join my family in a game of mah-jong 🙂 I guarantee that your head will swim as you try to figure out what my sisters are doing with the tiles! to go to Tilly’s and buy some. Through your memories, I have some of my own popping up and it’s great remembering some of them. So keep yours coming please. I can imagine you waiting anxiously for that ten cents to get some candies. Hopping from foot to foot. How sweet. Do you have a picture of you as a little girl? We’d like to see it. Please? Oh what sweet, wonderful happy memories. Sometimes those make us smile the most. Please keep them coming.